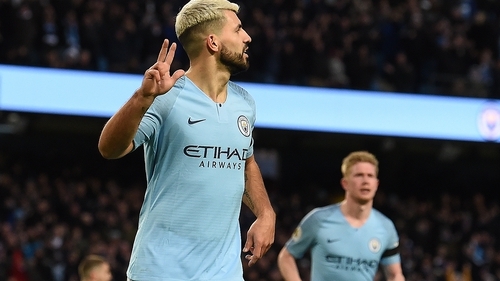 Manchester City's irrepressible record goalscorer was close to his blistering best on Sunday as he bagged a hat-trick in the champions' scintillating 6-0 thrashing of Chelsea. It also saw him become City's leading scorer in league football with 160 goals, extending his overall tally for the club to 222 in the process. Aguero said: "I am happy for the hat-trick and to break records in the Premier League and for the club. "I try to keep those good memories, and special thanks to my team-mates for helping me, but what matters most is winning. "I always try to play my game and help the team as best I can. My mentality is always to try to focus on my work and if it is with goals all the better. "What matters to me is finishing the season in the best way and winning trophies." Aguero's afternoon could have been even more profitable as he missed a sitter in the early stages and later headed against the bar. Aguero said: "We had a good game. I think it might be one of the best performances of this team. "We had great games against United, Liverpool and Arsenal but I believe it was a very nice game and an even more important result." Reflecting on his remarkable miss in front of an open goal from two yards, which occurred when the score was 1-0, Aguero said: "Sometimes those things happen but the annoyment lasted for five seconds. "Then I need to carry on, think about the team and try to score goals. Luckily in the next play I managed to do that."